A elegant Traditional low level toilet with ceramic lever from period bathroom specialists Old London, ideal for creating a period look in your bathroom. Manufactured using high-grade vitreous china ensuring a quality finish and long lasting durability. Bring a touch of elegance and style into your bathroom with the sublime Richmond collection of sanitary ware. Comes with a 5 year guarantee against manufacturing defects. Blends beautifully with Old London's range of traditional bathroom furniture. Comes with a top fixing soft close wooden toilet seat. 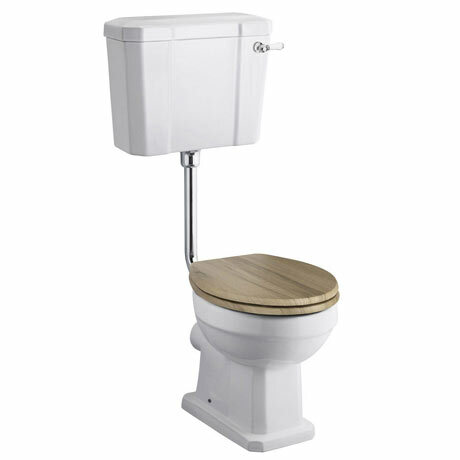 Wooden toilet seat is available in a variety of colours and finishes. Hi, it is not advised to modify the sizing of the cistern pipe, as it may impact on the flush. Thanks.